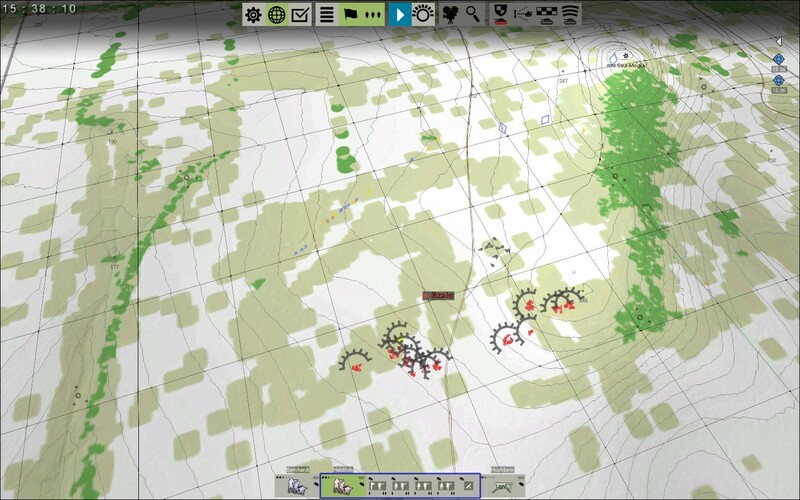 This is a self-made scenario assembled with the game's scenario editor. This post is a continuation from a previous one. 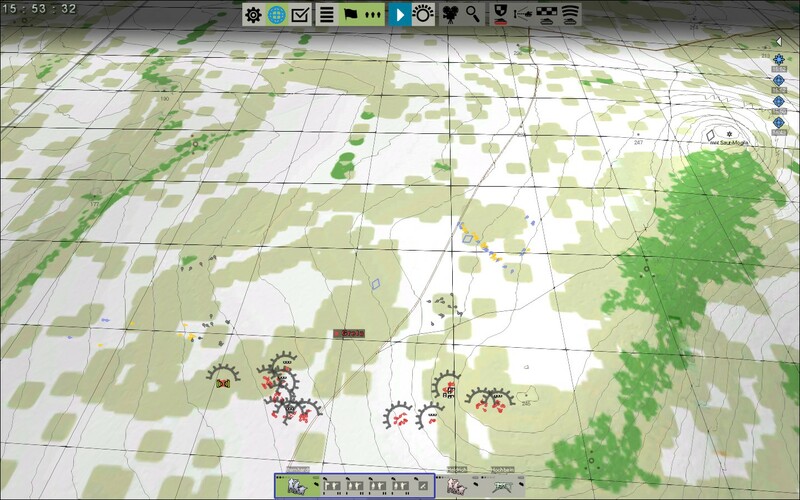 And then, a few minutes later, the enemy (yellow and blue icons) became quite clear. 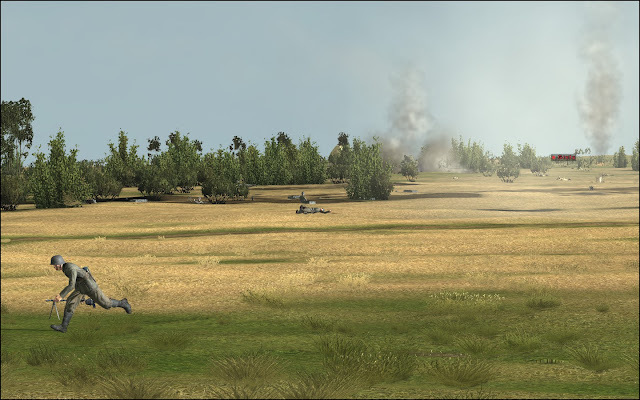 There was Russian infantry trying to turn our left flank. And the armor was assembling slightly to our right, probably to lead the infantry in a direct assault on OBJ Greta. 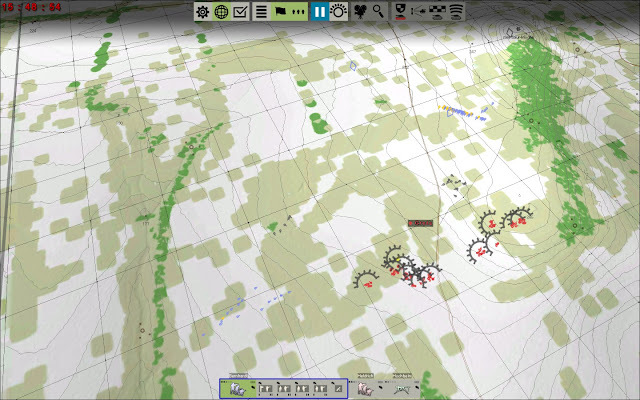 Note the blue and yellow icons showing the Soviet infantry and armor. 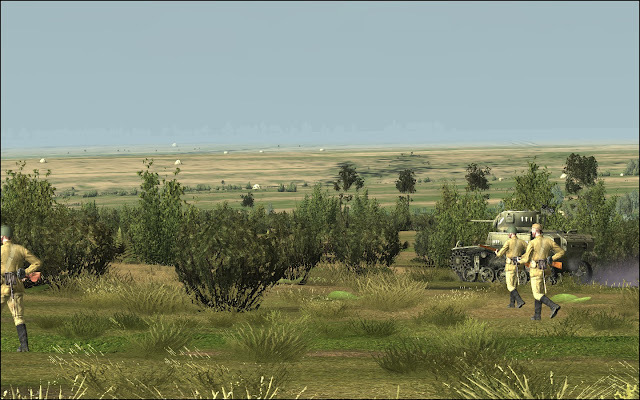 Soviet infantry supported by tanks moving nearby our right flank. 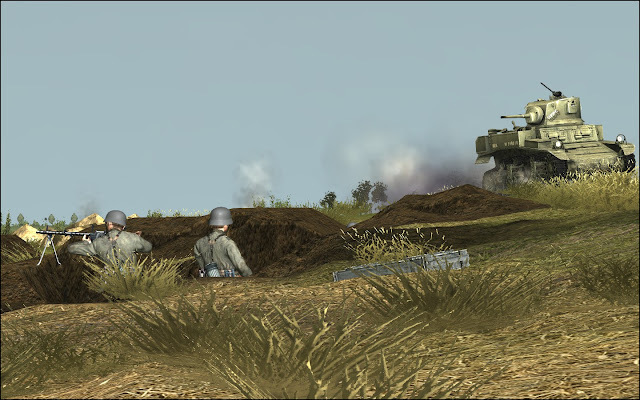 The German troops hold their positions against the left Soviet hook. My left wing holds on (note the grey icons, which are Soviet casualties) but when the Soviet combined infantry-tank attack continues to press towards OBJ Greta, a significant amount of crossfire rains upon my troops. Aided by the Stuart tank's fire, it's the perfect storm. Some squads start to rout in absolute panic. 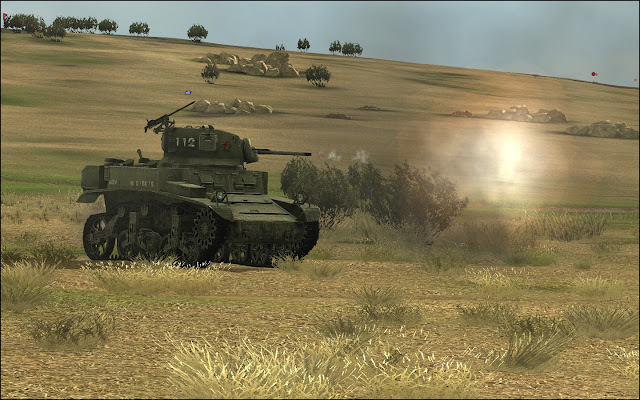 Reverse slope or not, the fire superiority imposed by the Soviet light tanks is daunting. Then the battle ends. Both sides are exhausted and shaken. This is a new debrief screen that shows the casualties and intensity of fire over time. I don't know what to make of this "minor victory". 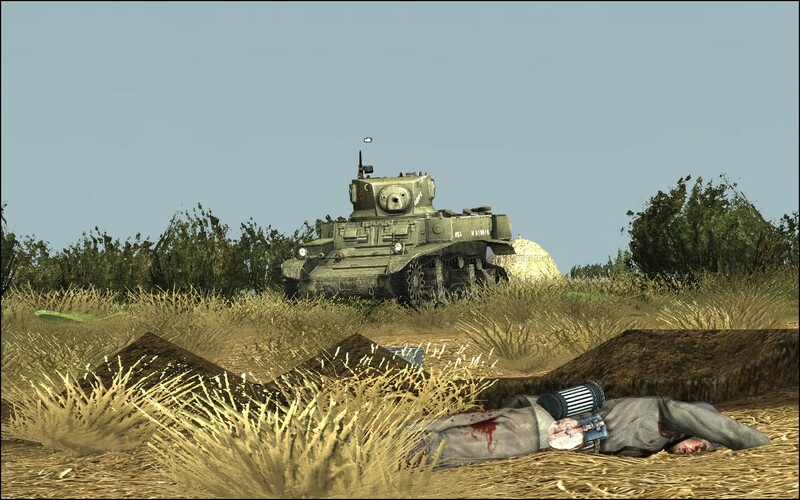 OBJ Greta was in Soviet hands and we would be unable to counter-attack. We were still in our trenches and holding tight, although at a very steep price. But observing the Soviet AI trying to outflank us without any script or user-edited waypoint, was a perfect example of how fantastic this game is. 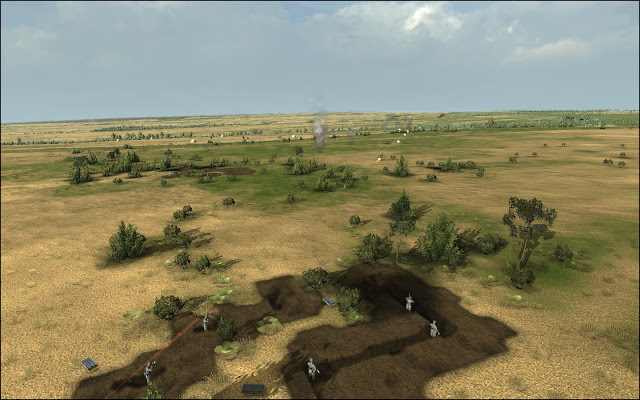 It was quite a shallow flanking maneuver, I wished I had left a squad or two for a counter-attack when the Soviets were pinned down. Well, i was wrong about the AI not being able to do anything in this situation. There is an "Overall results (Only losses)" row on the results screen. I think that means that in this quick battle only the losses of men and equipment affect the score. 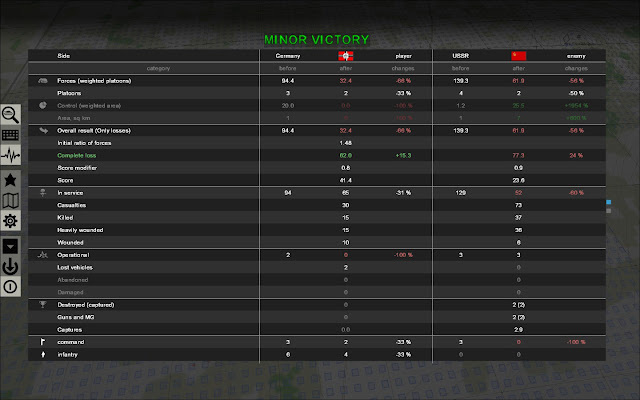 The AI started with more men and lost more in the end, giving you a minor victory. Will you ever play the campaigns? They are quite good. I'm curious though. On the screenshots where map is shown I can see 3rd russian tank icon near "mnt Saur-Mogila". 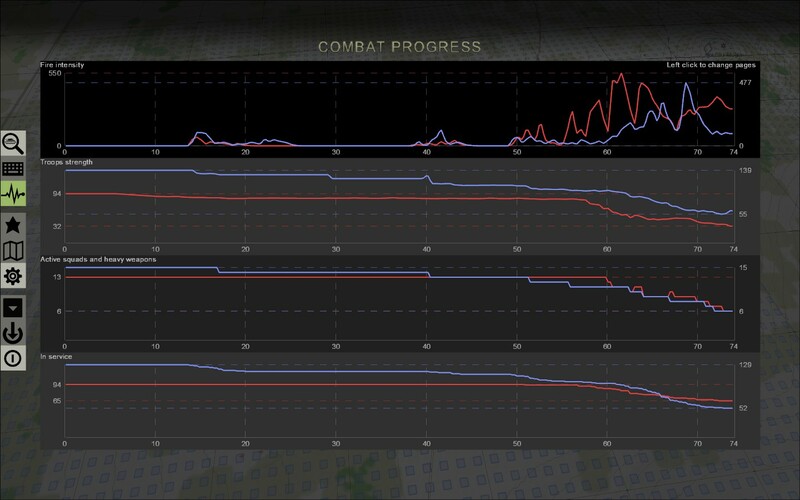 It looks like it was knocked out (it's blue at first and grey near the end of the battle). What happened? I suspect it wasn't tank at all, but some truck, or armoured vehicle used by recon troops? Thanks for explaining that to me. I never noticed it. The tanks at the Mnt Saur-Mogila are unlikely knocked out. The Germans have no AT guns or armor. And I didn't see them using handheld AT guns even when they had the Stuarts almost stepping onto them. I'm playing the campaigns right now. These type of reports are just for training purposes or for exploring tactics. That third Stuart just got stuck in some trench on the slope of Saur-Mogila. And the icon changed color since the tank is immobilized.